Swedish band H.E.A.T have released some great studio albums, but it's their live show that has really earned them a load of fans. 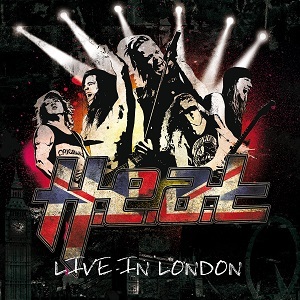 Now after releasing four studio albums, they're releasing their first live album - "Live in London". The album was mainly recorded at the Garage in London on 16th May 2014. Note the word "mainly" - of the 15 songs here, only 12 of them can have come from the London show as the other three songs ("1000 miles", "The wreckoning/Tearing down the walls" and "Downtown") weren't played in London, and a couple of songs played in London aren't included here. Having been at that London show I know it was a great night, so it's great to find it being released as a live album. As well as the setlist from London differing slightly from the album track listing, the running order has been changed too, but that's probably to make things flow nicely once the differences in the tracks are considered - the album needs to have the pace just right if it's going to convey the energy and enjoyment of a H.E.A.T live show. What can I say - you've got a setlist packed with superb songs being performed by a top live band, so it was almost inevitable that this would be an excellent live album. Eight songs from the latest album (Tearing down the walls) are included here along with another seven songs from the other albums, so what you have here is pretty much a "best of" setlist packed with catchy songs, great riffs, great vocals and all performed superbly. Fans of H.E.A.T definitely need to buy this album. If you're a rock fan who hasn't heard H.E.A.T yet then you really ought to give them a listen - and this album is a great place to start.